Hold up – there are imposter Shaker doors? A crash course. A true Shaker style door has 5 pieces to it. Four of those pieces surround the edges of the door, creating a recessed panel in the middle. Shaker style door and door fronts are very popular with IKEA kitchen buyers. 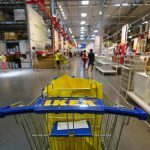 IKEA itself sells 4 different Shaker style doors: BODBYN in off-white and grey, GRIMSLÖV in off-white and brown wood, LAXARBY in dark brown wood, and TORHAMN in unfinished wood. But are they truly Shaker style? Some details follow. The BODBYN door actually has a raised center panel with beveled edges. It’s considered Shaker style because of the framing effect of the outer edges. The LAXARBY door is close to Shaker, but notice the extra groove on the inside of the framing edges. This extra detailing, much like the beveled edges of the BODBYN, is a departure from the simplicity of a Shaker door. GRIMSLÖV is IKEA’s closest approximation to a Shaker style door. In fact, many a designer would argue that it is in fact a Shaker style door. What Stacey didn’t like about the GRIMSLÖV door was the visible seams of the four surrounding panel pieces. 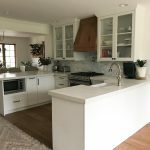 That last point about the 90° angle is why Stacey chose Scherr’s over Semihandmade Doors, another popular manufacturer of custom doors for IKEA kitchen cabinets. If you look very very carefully at SHM’s Supermatte Shaker door, you’ll notice what we mean. For those of you who are also true Shaker door aficionados, we hope we’ve helped you in your pursuit of this great white whale. Now, on to the rest of the kitchen! As one of our serious chefs, Stacey needed better appliances and a better workflow in her kitchen. You’ll notice some of the doors are missing. That was actually a strategic decision to make it easier to get things during the cooking process. In the far bottom left corner you see the hint of a structure. What is that appearing on the horizon? Once upon a time Stacey went to culinary school, and her family is in the restaurant business. She mainly cooks country/Southern food, and that means her kitchen gets a really workout (and scrubbing) on the regular. This is the new kitchen, from the same angle as the first old photo (at a slightly lower elevation). The open shelving was custom-built by Stacey’s husband to hold maximum weight. Stacey wanted to maintain some of the freedom of the door-free cabinets in the previous kitchen. The corner shelves hold items in frequent rotation so they never have a chance to get dusty. A BlueStar oven and range can handle many pots and pans at once, and the ZLINE range hood is powerful enough to get rid of smokiness or grease. While you can find both of those items online, the Boston Terrier is one-of-a-kind. This photo really gives you a sense of how the new peninsula brings things into much closer reach for the cook. The sink is Kraus and the countertop is soapstone. If that faucet looks familiar, you’re not having déjà vu. It’s the same one from last week’s kitchen! Just like IKD customer Liz, Stacey raved about the champagne color and loves how much it complements the grey Shaker style doors. 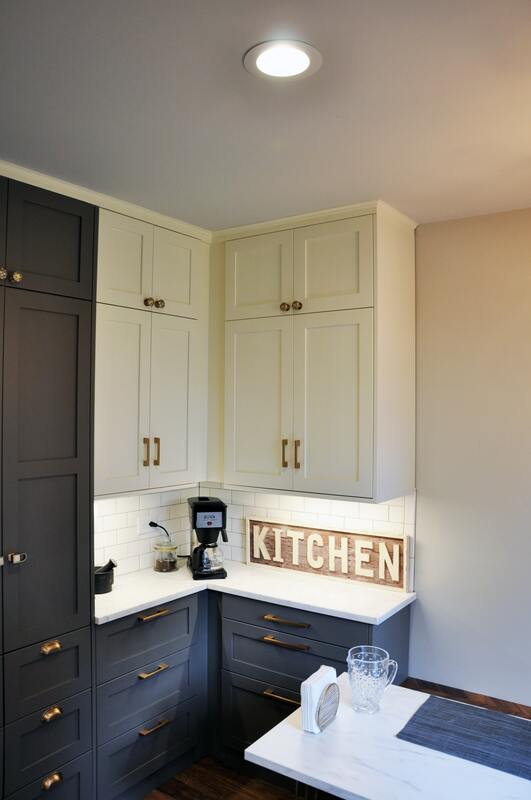 One of Stacey’s favorite features IKD came up with is this cabinet in the peninsula. You can see the top of this cabinet in the bottom left of the photo. Unlike the other cabinets in the peninsula, this one faces out. Can you also spot the IKEA hack in this kitchen? It’s where Stacey stores her baking trays. And ever since IKEA launched its new SEKTION kitchen line, we make a point of mentioning whether or not our customer choose to use the smaller inner drawers in their kitchen. But you know what Stacey does love about SEKTION? The drawer inserts. They’re fantastic for organizing and their mix-and-match flexibility means she can relocate things as the need arises. Instead IKD designed the bench for this lovely breakfast nook out of IKEA kitchen cabinets. The top of the bench is the BARKABODA countertop from IKEA. The BARKABODA is meant to be decorative and it works really well here. On the other side of the breakfast nook is the pantry. If you love storage, you’re going to love this. Make sure you’re sitting down. Look at all of those cabinets! Personally, we don’t think there’s anything this pantry section couldn’t hold. The two-tone look is pulled seamlessly into this section of the kitchen as well. We kinda wish Stacey would invite us over for a country breakfast now, don’t you? Thanks for sharing your kitchen with us, Stacey! It looks absolutely gorgeous, especially with those Shaker doors and interesting handles from myknobs.com and Anthropologie. If you’re a serious chef who needs a workhorse kitchen, get started working with one of our IKEA kitchen design experts today.